How do nationalist ideas emerge, evolve, and spread? How do urban spaces and the migration of people factor in? 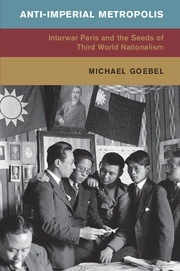 Dr. Michael Goebel joins Steven to discuss the arc of his research, ranging from nationalism in twentieth-century Argentina, to anti-imperialist activism in interwar Paris, to comparing urban inequality in specific global port cities between 1850 and 1950. He also comments on his interest in putting into dialogue discrete fields of history, the benefits of this engagement, and the impetus for co-creating the Global Urban History Network. “‘The Capital of the Men without a Country’: Migrants and Anticolonialism in Interwar Paris,” The American Historical Review 121, no. 5 (2016), 1444-1467. “Gauchos, Gringos and Gallegos: The Assimilation of Italian and Spanish Immigrants in the Making of Modern Uruguay, 1880-1930,” Past and Present no. 208 (2010), 191-229.